...like their work, do you think that means you wouldn't like them if you met them? Well, I'd have to disagree because, although I don't like Francis Bacon's work one bit, Mrs P-K says he was actually a really nice bloke (except when he was drunk which was not unusual) and she should know because in her wildly misspent youth she used to know him well when they both hung out late nights in the infamous and now sadly defunct Colony Room in Soho. Mrs P-K says that Bacon always had a big gaggle of friends around him even before he was even slightly famous. So I'd say that's proof that making obnoxious art doesn't always mean that the art maker is obnoxious too. Far from it. That's Bacon in the middle of a few of his other arty farty friends who were welded nightly to the bar at the Colony. I must admit he does look obnoxious though, doesn't he. Ah but did his friends actively like his art? Did Mrs P-K? I can't speak for Bacon's bosom buddies liking or even understanding his paintings. But, like many art connoisseurs, Mrs P-K tends to like any painting with a $142,000,000 price tag. So she liked the work and the artist...maybe the theory holds up. Anyone else have any experience of meeting an artist whose work they had an opinion on? To resurrect Heel's old question...I did once meet Paolozzi - not Paolozzi (Eduardo) - but his brother George Paolozzi who was my pottery teacher at school. He was a really great bloke. Kind, friendly etc. I owe him a lot. I liked him. And his pots. I also three times met Patrick Procktor one summer when I was working as a fine art wood-print printer clanking on a big old Albion Press...and Patrick Procktor was as affable a man as I've ever met. I liked him. And his art. I also very nearly met the 'kitchen sink school of art' painter John Bratby - at least, I met Bratby's wife Jean Cooke round at their house. She was also a painter and she was really nice whereas, from what she told me, Bratby was a bit of a curmudgeon. I liked her a lot but don't know if I'd have liked him that much. And I liked all their work. Still do. 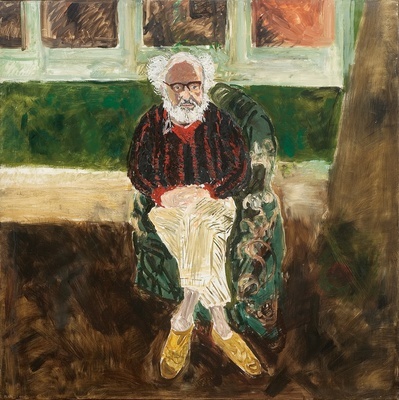 Here is one of Jean Cooke's portraits of her husband John Bratby. Cheerful looking bod, isn't he? It's a good likeness.